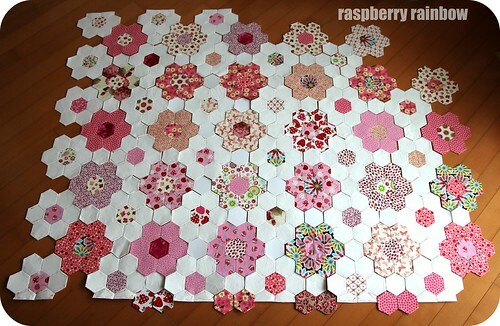 Raspberry Rainbow: The Pink Hexie Quilt, an update. The Pink Hexie Quilt, an update. It is about time I had an update on my Pink Hexie Quilt. I honestly have no idea how many more I will make. This is my "take away" craft. I take it with me everywhere. It is small and portable. I feel it is now time to be thinking about the edge of this quilt. I want the edge to be straight, that is all I know. I still can't decide if I will put a border on it or not. Any suggestions? I'll just keep hand sewing my hexie flowers for a little longer, and see where I end up. Who knows where, or when, that will be. Want. Badly! It's gorgeous! I think you'll just 'know' when it's done. Maybe just a simple pink bias border would look good. I think the quilt looks great. Have you finished it as of this date? 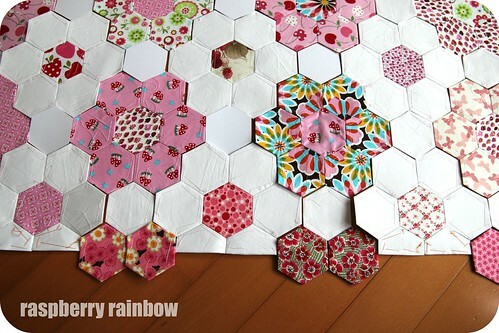 I am almost ready to sew the hexie flowers together. It will have a straight edge, with a binding border (probably pink, yes). I need to take some new photos. Do you want to wear a rainbow?